High dynamic range, or HDR, is arguably the definitive envelope pushing visual technology to grace television sets. It overtakes even the clarity bump offered by 4k resolution in spectacle when done right. and has since matured into a truly impressive visual addendum, with much more room for future improvements even still. And quickly, a pace no stranger to consumer technology, the technology made its mark on not only TV shows and movies but also select video games. Every single version of the PS4 can display HDR and as the technology picks up steam, more and more titles are adapting the technology. In this article we will go over the best PS4 games that have HDR so that you can not only sit back at the spectacle but also enjoy a genuinely good new game too. Dig into some of the best games on PS4 with HDR with our expanded list below as well as some games releasing 2018/2019 that will also offer the feature. Did you know that the standard PS4 and PS4 Slim are also HDR capable? It’s not just the PS4 Pro that has this feature, as you might have been led to believe by Sony’s marketing. Horizon Zero Dawn is one of the best exclusives and overall games for the PS4 in 2017, with sales totaling 3.4 million copies as of June 2017. HZD puts a new spin on the age old Ubisoft formula and crafts it into a game with an engrossing narrative, exhilarating and layered gameplay, some of the best visuals on the system, and a strong female lead to boot. The use of HDR completely changes the visual look of the game in a way that makes things look much more realistic. The color palette changes from an oversaturated look to something much more grounded and natural. The usual highlights and enhancements to contrast are here on display but the end result of a more refined look is the most staggering. Give Horizon a shot if the idea of battling robo dinosaurs among a rudimentary civilization, all interwoven in a compelling narrative, sounds interesting to you. A new expansion for Horizon Zero Dawn, The Frozen Wilds, also recently released adding more quality exploration and bombastic combat for players to experience. It flips Horizon’s previous landscapes on their head with a new scenic, snowy playable area, new questlines, new characters, and new enemies. The latest entry in the Gran Turismo is a tough one in terms of how it’s going to align with gamers’ tastes. The epicenter of this driving simulator, or “simcade” for those deeply entrenched in the genre, is nothing but masterful execution. Driving in this game is good, damn good. It’s everything else that makes it divisive. The quick of it is that you are absolutely going to love GT Sport if the idea of progression based online racing sounds ideal to you. There are typical ranks in place for determining skill as well as a sportsmanship rating that determines how clean of a driver you are. The addition of a sportsmanship rating is a giant leap forward for console racers as it’s the first time it’s ever been included. And in terms of the HDR implementation, the results are jaw dropping. Polyphony Digital, developers of the GT series, have always been wizards when it comes to realistic lighting but their usage of HDR takes Sport to new heights. The end result is HDR lighting that not only looks breathtaking but also creates an incredibly realistic visual representation. It is one of the best, if not the best, HDR game on the PS4. Battlefield 1 put an old spin on things for the FPS series after the modern military installments of Battlefield 3 and 4, with its coverage of the World War 1 era. And while modern era rifles, dmr’s, and light machine guns were swapped out for a more primitive toolset for use in the sandbox, the large scale battle cornerstone of the series remained intact as ever. Battlefield 1 is a game that is great for veterans and FPS fans in general that are a fatigued when it comes to modern military shooters and some of the downright ridiculous gameplay mechanics that have come with them over the last few years. Even the developers of Call of Duty have realized that players are sick of spastic aerial movements interwoven into gunplay. The latest installment in the series, Call of Duty WWII, has taken a hint from Battlefield 1 and reverted back to a previous era. Make no mistake, this is straightforward infantry and vehicular combat that has firm roots on the ground (with the exception of planes). This is not some alternate history timeline where jetpacks have oozed their way into the first World War. Battlefield 1 absolutely nails its execution in the visuals department thanks in part to the Frostbite 3 engine. And the recent patch that brought HDR has cemented BF1 as one of the best looking games on the PS4. The dynamic skybox and weather effects makes the WW1 shooter a perfect showcase for high dynamic range. It’s quite easy to sit back in awe as you take in the changing color palette and the dynamic nature of the sun’s light. Make Battlefield 1 the next purchase for your PS4 library, or backlog, if you value large scale battles, engaging combat, great sound design, and some of the best graphics on the system that also makes use of HDR. At the time of this article, Destiny 2 does not yet have HDR implementation, but don’t fret, it’s coming in a few short weeks. The official release for HDR will coincide on December 5th with the release of Destiny 2’s first expansion, Curse of Osiris. And we have a feeling that the HDR implementation of Destiny 2 is going to be absolutely stunning due to the use of lighting that’s already on display throughout the game’s breathtaking playable spaces, as well as the overall atmosphere and palette. While Destiny 2 may not have the absolute best graphics on the PS4 from a pure technical standpoint, its art style puts most games to shame. Art style is a visual instrument that can absolutely trump raw graphics, which is glaringly obvious with Nintendo games such as Breath of the Wild. What makes Destiny 2 a great game? The actual act of shooting and chewing through alien factions is an absolute joy and the execution of gunplay is truly masterful. 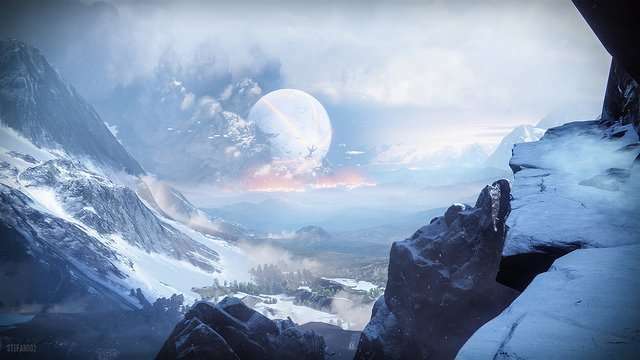 Destiny 2, while having its fair share of faults, is like its predecessor in that it cannot be faulted in the realm of actually playing the game, something that even many modern games fail to get right. It’s also pretty much the only game of its type on the PS4 – a shared world looter shooter. If you like hunting for armor, guns, and items that generally add to the flavor of your character then Destiny is right up your alley. Destiny 2, when it comes down to it, is a fantastic game for the proverbial ride along with friends. It’s relaxing while being satisfying but also challenging when you want it to be, with activities like the Leviathan raid and Trials of the Nine. And now is the perfect time to buy into the Destiny universe with HDR and the first DLC on the way. HDR is maturing as a technology and the implementation of visual highlight is becoming more of a common thread among new releases as opposed to sparse availability. A lot of the games with HDR in this article are PS4 exclusives as Sony has been nailing it, through and through, with their execution. And this trend is only going to continue with their first party releases in 2018/2019. It’s an exciting time to be a PS4 gamer with a 4k TV capable of true 10 bit HDR, with the tech really hitting its stride as of late. The same can be said for the current push of quality UHD Blu-ray releases and streaming services such as Netflix and Amazon Prime Video. Be sure to check back with Click Press Play for more coverage of HDR in video games and let us know what your favorite HDR games are in the comments below.